My husband so sweetly told me this week that he was proud of me and that I was brave and strong. I so want to be brave and strong but the truth is I mostly just feel weak and frightened. Cancer is a disease that dogs you. It just nips at your heals, threatens your peace and has a nasty habit of camouflaging itself for long seasons and suddenly reappearing in new locations with new vengeance. Even when you are cancer free, it whispers around the corners of your ears and reminds you that you are weak. I have a six-year season of victory – and it has been pretty amazing. God healed me so completely and so miraculously that I have found myself in awe of His goodness. However, the truth is I must be vigilant all the remaining days of my life – because this disease is just like our enemy, Satan. it is ruthless, persistent and mean-spirited. It is directly from the pit of hell and it works to steal, kill and destroy everything that I value. So how do I begin from here? How do I go from healed to ill to well again? How do I become a strong, brave girl? I’m learning that when God told Joshua to take courage (nine times in the first chapter of Joshua alone) it wasn’t because Joshua was a big chicken who needed to be coerced into obeying. It was because true courage requires obedience in the face of great fear. It was and is a fearsome thing to trust our God enough to simply obey. And about strength. No one ever told me that you can be completely, totally unable to do one thing for yourself or others – and yet in that moment – find there is still some thin strand of strength that just won’t let go. In 2 Corinthians 12:9 it says “My grace is sufficient for you, for my power is made perfect in weakness. Therefore, I will boast all the more gladly about my weaknesses, so that Christ’s power may rest on me.” I think this time around I am going to be quicker to confess my weakness, less worried about being so strong, and more focused on Christ’s power resting in me. I am going to need some help. I need the support of friends and family who will cheer my family on in this most recent adversity. Part of what can make us all brave and strong is the expression of love and support for one another. If you’ve brave enough or interested enough, please follow along with me. And consider doing more than that. Leave me a note of encouragement. I promise to read every one of them. And then go ahead and be a brave, strong girl (or guy) yourself. Face your adversity with a little sass and a lot of joy. Together, we can overcome and somehow weak and frightened will become brave and strong. Jan, I am embarrassed to say that I am one of those people who when faced with a situation where I don’t know what to say, I say nothing. So, please forgive my silence. It does not mean that I do not think of you and pray for you daily! I am so sorry you and your family are facing this again. I am standing and fighting alongside you!! Praying for you sister 🙂 You can do all things through Christ who strengthens you. Jan… You saw something special in me that I needed time to discover. You encouraged me to dive in to leadership and to use my voice via writing to spread the amazing truth of God through my eyes and testimony. I don’t think I would have ever been published anywhere if it were not for you, and I am truly grateful. I went through such a long wilderness season, but I will never forget that day in WILD when you looked at me and said God was giving me a new name. You told me I was was now shameless and had for the first time realized true forgiveness. I have never forgotten that word and have often claimed and spoken “Shameless” over me when the enemy comes to lie to me in situations. I stand with you in victory and war for you in prayer! I believe the names your husband spoke over you! You are brave and courageous. I have faith in what Jesus appropriated on the cross for us. Father God, by the power of the Holy Spirit, I proclaim the blessings of Abraham to overtake Jan body, spirit and soul that she may be blessed with peace, comfort and joy beyond measure and be completely healed in Jesus name! Big hugs! Thanks Kim for your love and support. I am so glad to be reminded of that day in Wild. You truly are an inspiration of grace to so many. Big hugs right back to you. Hi Kim, I haven’t seen you in awhile but I think of you often and enjoy watching your posts on Facebook. Your daughter is growing strong and beautiful. I want to say thanks for being so kind to me. I am so grateful God would allow me to speak a timely word of encouragement into your life – but we all know – it’s you doing the hard work of obedience. I am so proud of you and you are indeed “shameless.” Big hugs back to you. You are a beautiful woman inside and out! May God guide the doctors and yourself as you battle this awful disease. I pray a miraculous peace for you and your family. God has already conquered this struggle! We will begin to praise him for your healing!! Love to you and your family!! Love you Shannon – your whole family. I am proud to be related. You make me proud to be a part of our family. Love you lots. I think your husband was right. You ARE brave and strong. 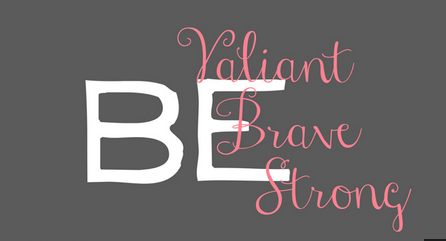 In my experience, brave and strong rarely feels the way we imagine it will. It usually feels, to me at least, like weak and frightened. But I’ve seen you in action, and your ability to lead women is a gift. You ARE brave and strong. Even when it doesn’t feel that way. So fight on, friend. I’m praying for you and cheering you on! Love this quote too – watch for it again! I added your quote to my sidebar – check it out! Thanks. Hi beautiful friend – I can’t wait to watch this – I remember the playbook issue. God is speaking to me over and over through the whole football, square up illustration. It’s like he’s showing me a personal battle plan – and you are showing me the enemy’s playbook. It makes me giggle. I can’t wait to see. I agree – this is not like it was before. Yes and amen. Praying for you and your family Jan; for healing, for peace and for strength. I LOVE you and I HATE this news. I will pray, sing, dance, confess God’s goodness, and thank Him daily for your healing. Oh Jan, I love you more than words can say. You exude strength and courage. I read a quote recently that said courage and cowardice are both contagious. You make others brave simply by being courageous. As John wayne says “courage is being scared to death but saddling up anyway”. I love you and am praying for you! I love this quote – I’m going to have to use it!! And I love you. Jan…I am using all the authority and power that has been placed in me to pray for you (remember the Spirit of God told you to tell me I have it!) …I am telling the devil to step back – you are a daughter of the Most High King and off limits to him. Of course I remember your authority. Thank you for using it on my behalf. Go ahead and rend the heavens! Love you, Jan! You ARE brave and strong!! I am cheering for you and praying, too!! I am devastated in hearing this news! I also choose to fight with you and for you! Reaffirming my love for you precious one! Thanks Sharon. You are so sweet. I will tell mom you sent me a note. He is in charge of your situation as well. And what satan fails to realize is that when he tries to stop us it only allows us to Be still and basque in the wonderful grace of our Heavenly Father. He is in control and will never fail us. You are brave and you are strong. And those moments when you are not “feeling” it just lay back in the arms of our Father. He is always there for us. To give us strength. This is a difficult walk. And my heart goes out to you and your family for being thrown into this battle again. But as it says in Ephesians 6:10-12 “finally, be strong in The Lord and in His mighty power. Put on the full armor of God, so that you can take your stand against the devils schemes. For our struggle is not against flesh and blood, but against the rulers, against the authorities, against the powers of this dark world and against the spiritual forces of evil in the heavenly realms. “. You will win this battle because you are a child of the almighty God. Hi Jami – I remember you. I am thrilled to hear of your cure. Praise Jesus! What a privilege to pray with you and to watch God delivery you from all infirmity. Congratulations and thank you for the prayer support. My heart is sad that you have to battle cancer again. I pray for strength and endurance for you and your beautiful family. You are an overcomer and have inspired so many! The first scripture that came to me as I read your blog was spoken over me in 2005 as I went through 3 surgeries for cancer in 5 months: “the battle belongs o the Lord”. Yes we are to suit up – square up – be ready on defense – and worship with every ounce of energy that we have! I will be praying for you in this battle. I adore this passage. There is something here for me… Thanks. Get up – stand up. That’s good stuff. Thank you friend. Praying for you and your family, sweet friend. And as I’m praying, I’m hearing ,”I’ve got Jan right here.” And His hand is over His heart. He’s got you, Jan, very close to Him. Love you. I love you friend. Thanks for that prayer. I happened upon this posting not knowing what you are currently walking through,this letter is a wonderful testimony of how brave you are and how much strength resides in you. Strength and courage are stored up inside you, all that you will need is available because of the great deposits of the word you have been faithful to feed on! You are strong even in your weakest moments because your trust is in the one who has saved you! Bravery is knowing when to lean on Gods strength and let Him lead you through unseen places. You are brave. He is strong in you. Our faith stands with you as you conquer this! I love you Jerri. Thanks for the encouragement. I love your definition of bravery. You, my friend, are brave and strong! I am praying for you and your family. The enemy is defeated and God is the victor! We will certainly love, support, and pray for you. You are one of our favorite Gateway gals and my girls (14 and 18) are regularly inspired by you. Thank you for standing up to the enemy instead of rolling over and quitting. We will stand with you. I’m so surprised your girls would know me…makes me feel so special. Thank you. How awesome that God has made a way for friends around the world to come together. We love you guys so much. I agree – He will heal me again. Wish we could hug your necks. I am so proud of you for being so brave and strong. I HATE that you’re having to go through this again, but we are here for you and are praying for you. We’ll be brave and strong with you. Thank you Stacy. I am so blessed and I feel your support. You are a good friend.